Last night in the shower I had an idea. What if, instead of heated beds and build chambers, the answer is just the opposite - flash cooling of the printed filament? So here's my proposal: A Darwin-style axes arrangement, with an X and Y gantry above and a Z bed below. The Z bed is put just above a bath of water (the height of which is under closed-loop control via a pump and drain), so that as it lowers down it can submerge into the water. 1. Maximum print speed. Some users have posted about how tall narrow parts require cooling between layers to prevent the prints from getting messed up, because the next layer begins before the previous one has had time to cool off. I believe this setup will eliminate print speed limitations, from a thermal point of view. Which is good because I see print speeds increasing signficantly in the future as software improves, as bowden-cable extruders take root, and as multiple-print-head systems start to allow for rapid infill with an infill nozzle. 2. Part warp. By cooling the filament as soon as it's laid down, I hope to reduce the build-up of thermal stresses leading to parts warping. This is somewhat counter-intuitive, and I'm not sure it will work. 3. Support material. Raising the water level just below the print level, that is to say the height of a support layer, might allow printing arbitrary overhangs. The hot plastic will hit the water and should instantly harden. To avoid creating waves in the water bath, the print bed might need to be somewhat porous. It might also be beneficial to increase the viscosity of the water (such as by adding a starchy thickener) or reducing the surface tension (by adding a detergent). I have wondered about the same thing, too. I believe that ABS is slightly denser than water, but it is close enough to act as support material. Instant cooling may decrease the bonding between layers, but make overhangs much stronger. The very narrow tip of may latest glass nozzles has made me think about what new techniques they can open up. I was thinking about Z axis extrusion. Move the Z axis upward, slowly, along with X and y if a tilted strand is wanted, and extrude VERY slowly, so that it has a chance to harden and support the next little bit. Buttresses and internal supports can be made this way. And maybe even flat, horizontal spans. Can't wait to get a machine working to try it. I want to be the first to make a single strand ARCH! jbayless - Would be great fun to experiment with. You could also try a cool air jet blowing across/ inside the part as it printed. (Attach it to the print head). Just don't get the hot bit wet ! Most of the "engineering plastics" I've worked with have densities around 1.4 g/mL. Most plastics will sink in water, unless they are foamed. A possible problem with such rapid cooling is that it may prevent subsequent layers from sticking to the already-printed ones. (I think that good layer-layer bonding results from the new layer just barely melting a very thin region of the one it's being laid down on. If that layer is too cold, the bond may be weak. My intention wasn't to float the plastics on water or to take advantage of buoyancy in any way, just to make use of the rapid cooling to avoid the need for support. If weak inter-layer bonding turns out to be an issue, then the water level might need to be lowered during some print operations to reduce cooling, and raised at other times (such as when support is needed or faster cooling is beneficial). I put a lot of effort into keeping the object warm to reduce warping, so I would guess that cooling it quickly will maximise warping unless you heat the water to just below Tg. The problem then would be water vapour as water at 70-80C is going to evaporate pretty fast. I think you need to watch a bunch of plastics too as they are hygroscopic (absorb water) to some degree or other. How much water the plastic has taken up can affect it's melt/remelt and fusing characterisitcs. On stickyness the technique we are using is FDM (Fused Deposition) if too cold it dont fuse. There is however perhaps a case for a hot water bath to reduce warping and as a support medium. Maybe by flooding the chamber to the layer below the one you are curently printing on. But need to watch out for the hygroscopic and fusing thing. A dimesnion machine I used once seemed to maintin the build chamber at 80 Degrees C. It printed ABS and used another ABS like material (but coloured grey) as snap away support. It would be fun to try but personaly I can't see enought gain in it to spend the time. Just a thought. What about two nozzles near the printhead? One blows heated air and the other cooled air, both under software control. on printing in exotic environents. there is perhaps some mileage in printing in a tank or chambger filled with a gas other than air. It is common in scuba diving and when making double glazing to fill insulating gas spaces with argon as it is a very poor conductor of heat. water conducts heat a bunch more than air. but argon conducts it less still. keeping the build temps from droping too quickly may help fusing and reduce warping. it does push the costs and fuss factor up a lot though. > cooled air, both under software control. Yes... Yes!! I think this idea has a huge amount of merit. The cold air nozzle could be an upturned compressed air canister; those emit a very cold blast. And a heated air jet is easy enough to create. Warping... let's think about it . 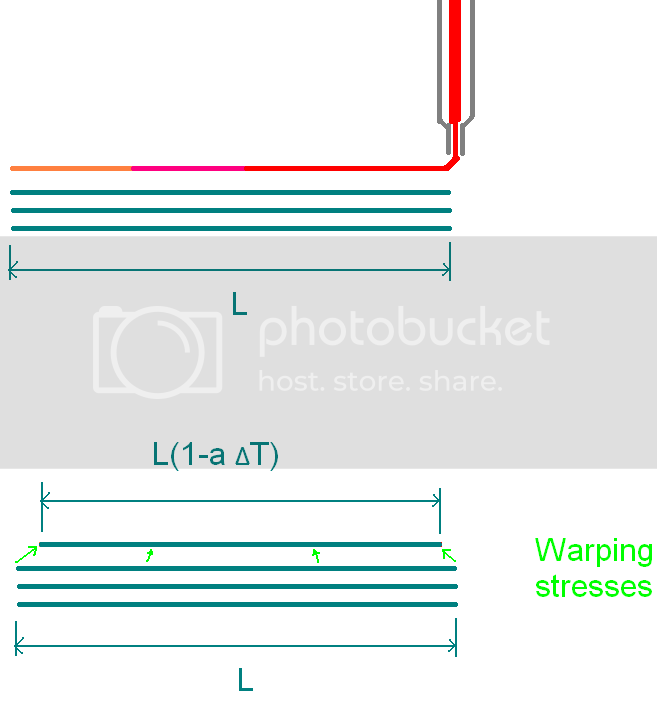 As I see it, the problem of warping stems from thermal contraction after the filament is laid down, which applies stress to the layer below (which, if cool, has already contracted). For a given filament, the rate at which it cools does not affect the stress from contraction after it's cooled. The problem is the difference in the filament length before and after it cools, compared with the cooled substrate length. This image shows the cause of warping. The hot freshly printed layer contracts when it cools, shortening its length. The cold layer below has already experienced contraction. When the top layer cools, it stresses the layer below. In this image I've assumed a hypothetical case where there is no thermal conduction between layers; this is a worst-case scenario. In reality, a lot of the heat from the top layer would conduct to layers below. That heat would cause the layer nearest to the top to re-expand slightly, which reduces the warping force when they both contract again afterward. But even with thermal conduction, the second layer from the top will not be as hot as the uppermost layer. Now, having a heated build chamber is one solution to this problem. It makes the ΔT between the fresh, hot layer and the substrate layer as small as possible, which minimizes the warping force. But it actually shouldn't be necessary to heat the whole object; just the immediate location around the print head. If you take any section of an un-warped object, and heat it then and cool it, the end result should be the same as what you started with. The part that you heated up will expand, and then when it cools it will return to its original length (provided that the heating was not so large as to cause it to melt, which would make the internal structure shift around to something new). Having a jet of hot air, or even a hot needle, locally heating up the point of the plastic exactly where the new filament is laid down, followed by a rapid cooling of both, would probably eliminate warping. If the top area is heated to about the same temperature as the fresh filament, then the two cooled together, will result in no thermal stresses because their nominal lengths will be the same. Here the area just in front of the print head is flash-heated, while the area just behind is flash-cooled. This results in a temporary thermal expansion in the material just below the print head, which gives that material the same nominal length as the printed filament. When the two are cooled together, there are no thermal stresses left anywhere inside the structure, and zero warping occurs. As an added benefit, the layer-to-layer bond might be even stronger than in a standard print. An upturned air canister would likely be quite effective as a flash-cooling method, but require frequent replacement -- this would probably contribute a lot to the cost of each print. A water bath could probably serve a similar role. However, as pointed out earlier, it might be necessary to consider the problem of hygroscopy, which I hadn't thought of when I first imagined this method. I don't think the cooling has to be so fast. It only has to be fast enough that when you start the next layer, the previous layers are mostly solid. A fan working as a global cooler might be enough. I believe developing a local heater will also be useful if you want to extruder threads smaller than 0.2 mm. The problem with thin threads is they don't carry much heat to melt the previous layer and bond to them. Having hot airflow would help a lot. If their is a way to divert the airflow around the heater, the local heater could be changed into a local cooler to help print overhangs by freezing the plastic as it comes out. ... i was thinking ataching some of my 5Watt-diodelaser-fibers around the printhead - first for heat-curing when printing with paste, second for heating/fusing the tray to the base when printing with a plastic extruder. What if the infill was done with a zigzag where the spacing of the zigzag was the same as the spacing of the infill of the layer below. Would the warping stress then straighten the zigzag rather than warping the part? It seems to me that straight lines for infill would be worst case for warping. Forgetting the overhang for the moment, probably the heating may do the job. Now the hot air is going to need to be fed around the extruder nozzle because you do not know which direction the head is moving relative to the table. So this means the nozzle is going to require another barrel around it. This may not be as difficult as it sounds - just some more nichrome? wire wound around yet another larger brass tube and air forced down the inside of it, with the extruder nozzle in the centre of this. For the air flow, a small model turbo fan and esc from hobbyking would work quite simply I think. hmmmm i like the idea of using halogen heating. a couple of low voltage halogen bulbs with metal reflectors would be good. the dichroic reflectors for halogen downlighters let a bunch of the heat out of the back. I've use aluminum tape [www.mcmaster.com] on my hot end. It might make an easy to apply reflector, though it is a bit expensive if you are only using it once. I may be able to do a double glass nozzle design, too, to all piping in hot or cold air as needed right around the filament just as it comes out. I like the idea of flash cooling to make vertical bridges. I was also thinking that slowing the extrusion and X-Y motion way down to allow it to cool normally might have the same effect. Sorry JB, we seem to have hijacked your thread and diversified into many other thoughts on improving bridging over open spaces. Slowing the extrusion with no active cooling might have a similar effect, although there's probably only so much that a filament can cool when the hot extruder is sitting right on top of it. And it would certainly increase the printing time of an object. Edited 1 time(s). Last edit at 08/16/2010 09:07PM by jbayless. I think nophead is on the right track - use the bath as a heated chamber rather than for flash cooling. Instead of a water bath, I'm sure another fluid may be workable - perhaps propylene glycol? I've been pushing this idea arround for a while - Using a heated oil bath - To reduce warping and as a support medium. I was planning on oikl because it is more consistent under temperature variations - so I can keep it heated without distorting it's properties too much (Whereas water will evaporate quickly when kept at 60 degrees). The oil was intended to allow much more extreme overhangs than current - There will still be limits (unless I can find a print material that is more boyant than the support liquid) however reducing that constraint would be nice. It does raise the issue of "tall" lines not cooling enough. I don't think buoyancy is a critical factor for support material. Gravity is not a strong force when dealing with these thin filaments; adhesion is the primary concern. Experiments have shown that Mendel can print upside-down, for example. A hot oil bath is unlikely to work as an effective support material, even if the oil is very dense, because the plastic won't adhere to it. My original recommendation of cold water was based on the fact that the water will flash-cool the filament, causing it to harden in place. Not based on buoyancy from the water.